G. K. CHESTERTON - A BRIDGE TO MODERNISM? Gilbert Keith Chesterton was born in Campden Hill, Kensington, on May 29, 1874, the Feast Day of St. Joan of Arc, the first Christian Nationalist. His father, Edward Chesterton, was a partner in a family firm of estate agents, which is still in business. He appears to have been an ideal father, devoting much time to both the education and entertainment of his two sons, Gilbert and Cecil. His mother, Marie Louise Grosjean, was of Norman descent, and it was, in Shaw's view, from this side of the family that Gilbert inherited his massive frame, growing in his 'teens to a height of six feet two. Mr & Mrs. Chesterton were Unitarians and "Freethinkers". Nevertheless they had Gilbert baptized on 1st July, 1874, in St. George's Church, Campden. Chesterton was a slow developer, not beginning to speak until he was nearly three, whereupon he dictated a fairy story to his nurse maid, requesting her to write it for him. He remained at Prep school a year longer than usual, going to St. Paul's at twelve. His teachers found him "unresponsive," "Absent minded" and "forgetful." His physical development remained slow, his voice not breaking until he was nearly eighteen. His mother, growing anxious, took him to a brain specialist who informed her that her son's brain was the largest and most sensitive that he had ever known and that he was "Either a genius or an idiot." In fact Chesterton was a genius. When his classmates formed the "Junior Debating Club" it was to Chesterton that they turned for a Chairman. The club produced a magazine "The Debater," to which Chesterton contributed major articles. The journal so impressed the High Master of St. Paul 's that he described Chesterton as "Six foot of Genius." In his last year at the school (1892) he won the Milton Prize for poetry with a poem on St. Francis Xavier. Gilbert's friends went on to University whilst he, deferring to his father, went to the Slade to study art. He appears to have gone through what today would be termed an "Identity crisis." "Who am I?' "How can I be certain that there is an external world?' He himself was to say that it was the "broad humanity and democracy" of Walt Whitman's poetry which saved his sanity. Chesterton did not pursue a career as an artist and after leaving the Slade worked as a publishers reader - a notoriously under-paid and overworked job. He probably would have remained In that position for life, his own manuscripts piling up in his bedroom, If he had not been introduced to Frances Blogg, one of three remarkable sisters. Frances badgered him to take his work around publishers and editors. The results were remarkable, soon Chesterton had a regular weekly column in the "London Illustrated News" and his articles, essays and poems were appearing in so many magazines that it was claimed that there was no such person as "G.K.C." for such an output could only be maintained by a "committee" of authors! 1) That the only way to preserve liberty is to preserve property so that the individual and the family may in some degree be Independent of oppressive systems, whether unofficial or official. 2) The only way to preserve property is to distribute it much more equally among citizens so that all, or approximately all, may understand and defend it. This can only be done by breaking up the plutocratic concentrations of our time." Was it, as Shaw maintained, all a waste of Chesterton's time and talents? Ghandi did not think so. It was an article by Chesterton on Indian nationalism which inspired his own thinking. Schumacher did not think so, for the original title of his seminal book, "Small is Beautiful" was "An Essay in Chestertonian Economics." Who today would argue against a "Property owning Democracy", where "property" means a source of independent livelihood and not mere disposable income for consumerism? Chesterton's voluminous output, in every field of literature, continued up to the last year of his fife. There was a tailing off as his heart failed, and he died at 10 a.m. Sunday, 4th June, 1936. The cause of death was simply that Chesterton's heart was not large enough for his massive frame and punishing schedule of work. He died of doing the work of ten men. He died from being G. K. Chesterton. It is perhaps ironic that most people know the name G. K. Chesterton in connection with the "Fr. Brown" stories. Brilliant as they are as detective stories, they were, and Chesterton regarded them as, "pot-boilers," written when money ran short. It is impossible, even in a book length study, to evaluate all of Chesterton's work, the range is too great - illustrator, novelist, biographer, historian, critic, philosopher, lecturer in three continents, broadcaster, short story writer, journalist, editor, and poet. It is the last description that is usually challenged by students of poetry and it is that aspect of Chesterton that I want, briefly, to touch upon for it is the poetry which establishes Chesterton as the bridge between the 19th and 20th centuries. There has been a long debate upon whether Chesterton should be regarded as a poet or as a writer of good verse. The distinction is important, for there has been an even longer debate on the difference between poetry and verse. Verse is in fact fairly easy to define; we can say that it is strings of words which make sense, arranged in a rhythmic pattern. Poetry defies any such definition. Chesterton himself was greatly influenced by the democratic vigour of Whitman, but Whitman's LEAVES OF GRASS was written in free verse, a form Chesterton did not favour. It was probably Whitman whom Browning, a master of the arts of prosody admired by Chesterton , dismissed in an aside as "The new prose-poet." Kipling was an extremely competent writer of verse, yet for me at least his work does not have the quality of poetry. Critics have coined the phrase "Public Poetry" to describe Kipling's type of verse, and such public poetry has an honourable and ancient descent. Knowledge may be considered as a two-dimensional activity of the mind. We speak, habitually, of a man having a "breadth of knowledge." Understanding however is a three-dimensional thing and we recognize this by speaking of a "depth of understanding." Understanding is a mental experience; a sudden insight, the achieving of a perspective, from which standpoint all manner of known things fall into place and assume a pattern; a pattern to which new knowledge can be assimilated. It is, I would suggest, the communication of that insight which is the mark or quality which differentiates poetry from verse, music from instrumental exercises and art from representation. To take the analogy further, the distinction between poetry and verse may be said to lie In the deepening of the work by the appearance of a "third dimension." It has been suggested that poetry is the "quintessence of thought" and this accords with the Idea of a "third dimension, " of a deepening into "insight," or as Hopkins put it, "inscape, "communicated to the reader by the quality of the verse which is its medium. Was Chesterton on these criteria, a poet or a writer of verse, sometimes serious verse, sometimes light, sometimes sonorous, sometimes witty? The answer is both. The reason for that is probably that Chesterton was not a-poet-and-only-a-poet, as all the great poets were. The very universality of his literary output made it impossible for him to concentrate upon poetry. Much of his verse is indeed journalism - witty verse comments on events of the week written for the Saturday morning papers. Of the longer poems The Ballad of the White Horse is considered by most critics as the best. 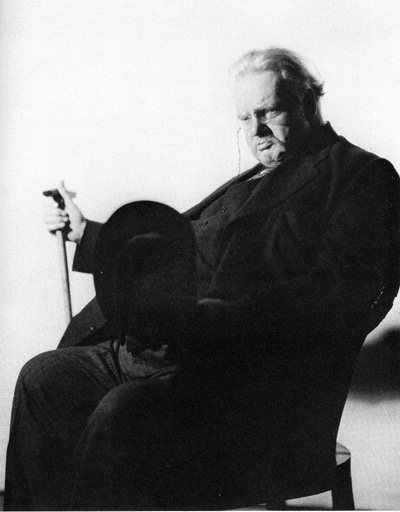 Chesterton devoted more time to it than to any other of his works. The casual reader might see it as "merely" a narrative poem, possibly "more public poetry." Attentive reading however reveals it as a deeply metaphysical poem, a poem of the struggle between pessimism and hope in which hope in the person of Alfred is triumphant over fatalism in the person of Guthrum. The high tide and the turn!" Nevertheless I wish to enter a plea for the least known of the long poems - The Ballad of St. Barbara. In his Introduction to The Works of G. K. Chesterton: (The Wordsworth Poetry Library, 1995,) Peter Faulkner states, "Although the publication of his poems occurred in the years when Ezra Pound and T.S. Eliot were revolutionising the practice of poetry Chesterton... paid not the slightest attention to Modernism." It is strange that Faulkner should have paid no attention at all to Maisie Ward's "Gilbert Keith Chesterton" in which she includes a number of free verse pieces from Chesterton's notebook, some reminiscent of the early Pound. Chesterton, as we know, admired and was influenced by Walt Whitman, and from where else but Whitman did the American poets, Eliot and Pound (Longfellow's nephew) learn their first lessons in free verse? (Yes I know all about Baudelaire, Rimbaud and Laforgue.) Chesterton was familiar with the Modernist case and its reliance on free verse; his To A Modern Poet demonstrates that. I suggest that he grasped, before many others did, that free verse is not the essence of Modernism. The creation of a multi-faceted perception of reality is. The Modernists achieve this by an interweaving of perspectives, a rapid "switching of camera angles" from image to image. For this, free verse is the most appropriate, but not the only possible, medium. In St. Barbara Chesterton does just this; interweaving the legend of the saint with the narrative of the battle, switching from the hearing of the ear to the image of the eye. And what a sustained image that is, the image of the flashes of the thundering artillery as windows breaking open in the day! The most famous image in English literature, that of Donne's compasses, is sustained through twelve lines. Chesterton's image of the windows blasted in the sky is sustained throughout the whole poem! St. Barbara however was not the first of Chesterton's experiments in form. Lepanto, it might be expected would be a straight forward battle narrative of the Tennyson or Campbell sort, but it isn’t. Chesterton's "camera" roves and switches without warning from Byzantium to Rome, London, Paris, Spain; from present to past and to future things darkly hinted: from politics to theology, from the cavalcade to the armada, all in a series of vivid images: "that which presents an intellectual and emotional complex in an instant of time." (Pound.) All this before either Lustra or Prufock. Professor Wren-Lewis (Sydney) ranks Chesterton as one of the "Sages of Aquarius," seeing him as a "forerunner of the great upsurge of free spiritual enquiry that began in the 1960s." If he is right this would certainly establish Chesterton as a bridge between Victorianism and Modernism, between "Public Poetry" and the "Inward experience" of Modernism, but how does he stand as a poet? Chesterton cannot be placed among the great poets who preceded him, but neither is he a minor poet. Perhaps the final judgement must be that Chesterton is, among many other things, a poet who bridged two ages. 2. Monahan B.W. Aims of Education appendix to Mystery Magic Music and Metaphysics: Tidal Publications, Sydney N.S.W. 1971. 3. Eliot, T.S.quoted in The New Poetic (page 129)Stead, C.K.Hutchlnson, 1960. 4. Davie, D: in Twentieth Century Poetry (page 200) Open University Press 1975. 5. cf. Communication Tongued with Fire - Chesterton Review Vol.XXII, No. 4., November, 1968. Anthony Cooney's monograph on Chesterton: One Sword at Least – G.K. Chesterton (A5 papers 38 pages) is available from Third Way Publications, P.O. Box 1243, LONDON, 5W7 3PG, price £2.50 inc post.